In July 2015 the multi-interest Nicola Lake Steering Committee, which was overseeing implementation of the Nicola Lake Action Plan, decided that it should expand its terms of reference to address issues affecting the whole of the Nicola watershed. The Nicola Steering Committee has overseen projects in 2015-2016 to benefit the watershed — in particular, see the Nicola Fish Water Management Tool. The Steering Committee also believes it is important to develop a Nicola Watershed Plan if funding becomes available in future. For helpful resources on the Nicola watershed, see Nicola Watershed Resources. To learn about the backdrop to this initiative, read about work undertaken between 2012 and 2015 under the former Nicola Lake Planning Process. If you have questions or would like more information, contact Tracy Thomas, Assistant Regional Manager in the Fraser Basin Council Thompson office. 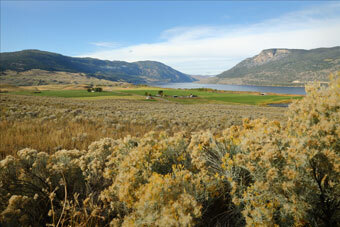 Work is underway on a new web-based Nicola Water Management Tool (NWMT) for the Nicola Lake dam. The NWMT is intended to allow operators at the Nicola Lake Dam to consider a wider range of biophysical, ecological and socio-economic factors helpful for dam operations, including the in-lake and downstream consequences of water releases in terms of predicted flows at key index locations. Phase 1 (project design) has been completed. An interim tool will be operational in July, 2016 to help with drought management this year (Phase 2A). Funding is being sourced for the remaining tool development (Phase 2B). The tool is scheduled for completion in the Spring of 2017 if funding is available. Once the development is complete, user training will take place (Phase 3), also contingent on funding. Integral to the project is upgrades of gauging stations and possibly the development of monitoring wells that provide data for the tool.